The Hotel and Hospitality Industries Continue to Embrace The Book by The Award Winning Music & Entertainment Agent Mark Sonder, CEO of Mark Sonder Productions, Inc. This book is the most comprehensive compendium of entertainment and production art and science that has ever been assembled. Author Mark Sonder, MM, CSEP and Chief Entertainment Officer at the award winning music and entertainment agency Mark Sonder Productions, Inc. is proud to announce that the reach of his full-length hard cover book, "Event Entertainment and Production," continues to be grow as the next generation of meeting and event planners becomes aware of the only text on the subjects of music, entertainment and production for the meetings, events and hospitality industries. "Although it has been a decade now since its first printing," Sonder states, "this book, considered the singular source on this subject matter, is now in the hands of many meeting and event planners and all colleges and universities which feature a meeting and event management department." "I am proud to say that my publisher is the large firm, John Wiley & Sons, Inc.," continues Sonder. 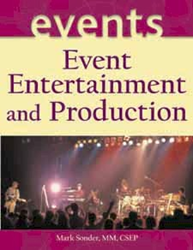 What people are saying about Mark Sonder's, "Event Entertainment and Production:"
"…this book is the most comprehensive compendium of entertainment and production art and science that has ever been assembled." "I already have a copy and that's how i know it is great. You are a wealth of knowledge." "Mr. Sonder has crafted an important body of work which is an essential for every Event professional." The book is widely available and also online at Amazon.com. About author Mark Sonder and his company Mark Sonder Productions, Inc.
Mark Sonder is a Certified Special Event Professional since its inception (1993) and a founding member of these trade associations: The International Special Event Society, The Association of Entertainment Professionals, and The International Association of Corporate Entertainment Professional. Sonder also sits on the faculty of The George Washington University in Washington DC. His company was created in 1985 to fill a growing need for music, entertainment, speakers, headline entertainers and supportive production in corporate and association meetings, conventions and special events plus facilities, casinos and concerts, the company in its 29 years, has worked in the US, Canada, Mexico, South America, Europe and Southeast Asia.